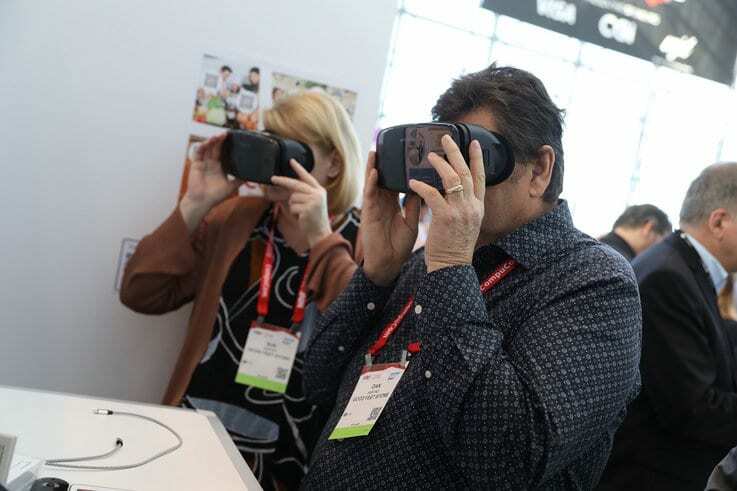 Among the highlights of this year’s NRF show was the Innovation Lab. A who’s-who look at all of the top retail innovations and start-ups out there, the Lab was home to two exhibits on the latest and greatest in retail tech. Retail 2020 showcased “technologies of the future” and how these are changing each part of the retail journey, while the Emerging Technology Shocase showed how cutting-edge tech can help retailers with hands-on demos. We’ve rounded up our 45 favourite Innovation Lab exhibitors, from across the Retail 2020 and Emerging Technology Showcase exhibits, that show what the future of retail might look like. Through the combination of specialist display technology and IoT innovation, Glass-Media is dedicated to enhancing the customer experience surrounding physical retail, including storefronts and in-store. As a result, foot traffic is increased and negative space is utilised effectively. Through the use of AI, Satisfi Labs gives retailers new ways to engage with their customers through branded chats. Specifically engineered to interact with numerous data sources across different online platforms, the company facilitated two million AI conversations in 2017. By using in-depth data analytics, Tangiblee builds, manages and optimises a retailer’s product pages to contextualise a consumer’s shopping experience. Working through the product content that already exists on the retailer’s site, the integration is seamless. With a belief that it’s not just about the amount of traffic entering a retailer’s store, but it’s what you do with that traffic, Mystor-E brings powered innovation typically seen in e-commerce into a physical brick-and-mortar store. Through the use of algorithms and apps, the brand works to grab data and use it to convert customers. As an immersive technology company, YouVisit help retailers, via its Aria platform, to create engaging 360 degree experiences through a variety of content across mobile, desktop and VR. And, with its powerful analytics engine, the company offers data-driven conclusions on how your consumers are behaving. Currently the market leaders in 3D advertising display solutions, Provision produces interactive customer experiences through the use of 3D holographic displays, particularly within a retail setting. Including specific uses such as coupon redemption, it comes at a time when 3D revenue display is expected to reach $22billion by the end of this year. With its automated ‘Complete The Look’ technology, FINDMINE fuses styling knowledge with technology to produce complete outfits around products on sale. The company reports that use of the system improves efficiency for merchandisers by 100 times. June20 is a brand that wants to create an effective in-store experience by introducing features typically found online. It does this through the creation of kinetic retail displays that recognises customers as they approach, personalises retail experiences and facilitates seamless transactions. EverThread is dedicated to creating software that streamlines image asset production and makes it easy for retailers to offer their consumers detailed and accurate product imagery. As a result, costly photograph production is reduced and consumer trends can be easily identified. Combining real-world product recognition with barcode and catalogue scanning technology, Slyce is a universal scanner and all-encompassing visual search solution. When users take a photo of, or scan an object around them, they receive direct matches or similar results. Offering a solution to the fact that the brand states consumers, on average, are willing to pay up to 20% more for products that are personalised, Strypes helps retailers create a sense of ownership before products are put into cart through an interactive 3D design experience. Working in-store, online, via mobile and social media, and through Amazon Alexa, Revieve gives beauty brands the opportunity to analyse their consumers’ selfies in order to offer more personalised recommendations. The brand has reported that it increases conversions by 25%, retention by 18% and basket size by 22%. With an aim to introduce a more personalised fitting experience to the footwear industry, Volumental combines 3D scanning technology with AI to give consumers highly personalised footwear recommendations. Dor is a wireless, thermal-sensing foot traffic monitoring system. With a dedicated analytics platform, it allows retailers to determine foot traffic trends within their store and, with its in-app weather feature, helps retailers understand the impact of weather on their business. As specialists in making the physical world digitally interactive through mixed reality, Spacee’s technology works to transform any 2D or 3D surface into an interactive touchscreen without the need for phone, headset or surface installation. The technology is also designed to be a powerful communal experience, delivering a deep personal connection between users. Focal Systems is a company that uses deep learning technology to fully automate the physical retail experience. It does so by providing retailers with real-time stock tracking, better inventory management and shopping behaviour analytics. Through its SaaS platform, Narvar is dedicated to driving customer loyalty and retention through the creation of contextualised post-purchase experiences. Working with data surrounding a customer’s actions and interactions during the purchasing process, it works across all digital touch points. With a belief that robots will become an integral part of our future society, Five Elements Robotics wants to revolutionise the human-robot relationship. Though they have developed robots for consumers, they have also developed ones for businesses to increase sales, reduce expenses and provide real-time inventory control. Locus Robotics is a brand that creates autonomous mobile robots to optimise a retailer’s warehouse operations. Designed to integrate seamlessly within an infrastructure that’s already in place, the robots also respond to e-commerce volume growth and seasonal peaks. Described as ‘an augmented reality platform and a creative studio, rolled into one’, Zappar creates immersive AR experiences. By adding a new visual layer to the real-world through a handheld device, Zappar can turn any physical object into a multimedia delivery channel. Wanting to make the delivery process faster, smarter and more cost-effective, Starship Technologies develops self-driving robots that can carry items within a two mile radius. Parcels and groceries can be delivered from stores or hubs to consumers, who can track the delivery in real-time. Cognitive Operational Systems, Inc or COSY, is a technology enabling robots to navigate retail store floors, manage inventory and provide indoor localisation. By using AI and beaconless technology, it wants to help retailers increase revenue and efficiency. It’s a well-known fact that consumer returns are a pain-point for retailers. Optoro wants to change that. It offers brands an end-to-end solution that allows them to tap into the revenue lost through discarded, overstocked and returned goods. As a consumer analytics company for physical store environments, Kimetric offers retailers data regarding the consumer’s entire purchasing process, from their age, gender and size to their moods and what they’re looking at. Ranked in the top 25 fastest growing companies on Deloitte’s Technology Fast 500 list, Trax Image Recognition wants to digitise the physical retail environment. It does so by delivering real-time, actionable insights to leverage insights and unlock new revenue opportunities. Designed to provide a comprehensive wellness assessment, Fit3D offers full body scans that determine silhouettes, exact measurements and posture analytics. With this data, consumers can purchase not just customised products, but other services based on that data. Obsess is a platform enabling retailers to create mobile shopping experiences within AR and VR. With 78% of US Millennial consumers stating they want to see AR/VR incorporated into their shopping apps, the technology is particularly effective within the fashion, home and lifestyle sectors. By using AI and data analytics, Genostyle builds a style profile on a customer’s buying behaviour. From that profile, the company then provides DSP or Dynamic Style Personalisation so retailers can push the right products at the right time, and improve inventory planning and consumer retention. Through the use of robotics, Fellow Robots wants to optimise inventory for retailers. The technology works by determining out-of-stock products, price discrepancies and misplaced items and, after doing so, notifies employees to rectify issues instantly. LOOMIA is a technology company that creates electronic layers that can be embedded into textiles for heating, lighting, sensing or data-tracking applications. As a result, shoes can be heated, interfaces can become touch-sensitive and garments can begin collecting data. Through the power of AI, Sentient Technologies wants to improve engagement, increase revenue and conversions for e-commerce retailers. Founded by the co-creators of what became Siri, it creates more effective ways for retailers to merchandise, recommend and display their products. KiraKira3D wants to encourage the next generation of innovators, makers, designers and architects by blending art with engineering. Targeted at the Gen Z demographic, the company helps young people learn 3D skills through technical online classes and share designs through the KiraKira community. Using powerful image recognition, mobile AR and fashion e-commerce specific AI, Catchoom offers visual shopping solutions to help consumers make faster and more informed decisions whilst shopping. According to the company, an independent benchmark study rated Catchoom’s performance at 20% higher than its competitors. VirtualAPT builds robots that create 360-degree VR videos for use in various shopping and branding experiences. By bringing a realistic in-store experience to the home in the form of a web-based, interactive video, the company could, for example, allow someone at home to view 10 different apartments in 20 minutes. With a belief that every customer interaction is a potential selling opportunity, MAGIA.AI is a cognitive selling platform. Through deep domain expertise, AI-powered selling, natural language understanding and hyper-personalisation, the platform prides itself on being human-like. Cappasity is a company using interactive 3D images to bring an in-store experience to an e-commerce setting. Users of the technology are said to see higher conversation rates, fewer returns and fewer customer enquiries. The use of 3D images is also said to increase engagement and conversion over static images by up to 30%. A solution for furniture and home supply retailers that want to expand sales through AR and AI, LexSet provides object recognition, spatial search, product assembly assistance and automated surface tiling to online consumers. Powered by AI, DeepMagic has developed a fully automated store format that allows merchants to run staffless stores, save costs and eliminate shrinkage without losing the essence of experience. As the world’s first and only on-demand authentication solution for luxury goods, Entrupy uses AI and machine learning to determine whether something is real or counterfeit. Perfect for luxury resellers or online marketplaces, the system works with a 98.5% success rate. Described by the company as a ‘workforce augmented reality platform’, LogistiVIEW uses technology to optimise tasks found within the modern workforce. Powered by the company’s proprietary VIEW platform, it promises to make a workforce faster, smarter, safer and more accurate. Integem’s software empowers companies to create their own personalised and interactive AR experiences. Without the direct need for special hardware or glasses, the process is simple and can be used to benefit in-store experiences, marketing opportunities and customer loyalty. Facenote is a state-of-the-art face recognition platform that, through the process of customer recognition, can improve customer experience. With no dedicated hardware required and taking less than 10 seconds to train new consumers, the system also ensures customer privacy at all times. Offering a solution for retailers to provide customers with a personalised in-store experience without compromising on security, SwiftGo is a mobile app platform. With easy implementation, the app also works to learn more about the customer’s individual shopping habits. SkinGenie is the world’s first AI and DNA-based skincare advisor. By providing a saliva sample, the company will extract your DNA, analyse that DNA and provide a curated list of products tailored to your skin. After realising that brands and retailers are losing billions of dollars in lost sales due to the inability to monitor shelf space, Inspector Cloud detects what goods are on shelves and generates actionable reports within 10-15 seconds. Don’t miss our round-up of all of the action from the show, including top insights on the future of retail.